Read more about this painting here. Dance evokes strength and sensuality in all of us. This commission was created for a dancer who lovingly respects and has gained many beautiful memories of her 10 + years of her Oriental Dance journey. Inspired by the Wadi Rum desert in Jordan, this painting was created for a dance mom and her daughter and son. Mysticism and dance combine in this restful and meditative painting. The woman surrounded by a deep turquoise blue is symbolic of the psyche, shadowy and mysterious. She pulls the veil looking towards the light, to hope, to dreams, aspirations, clarity, what ever it may be, only she knows. This lovely small art work is a great fit to a cozy and intimate space. Inspired by an Egyptian Classical song written by Mohammed Abdel Wahab and sung by Om Kalthoum. Purchase of artwork comes with a digital copy of my favorite version of the song. Bold and mystical, this Turkish Romani Girl will blossom sass and earthy celebrations for your dancing feet and swaying hips. A golden opportunity awaits when we submerge into the depths of our psyche. With trust and faith, there is nothing you cannot do! This intimate piece inspires meditation and peace for our most personal places of our dance-life. 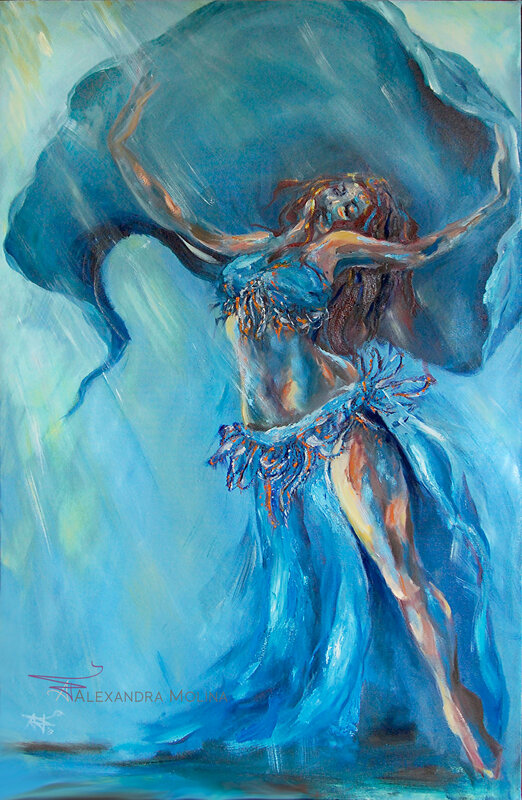 Inspired by the Miami Belly Dance scene and the beautiful sunshine of our home, this energetic painting empowers and inspires at every glance! 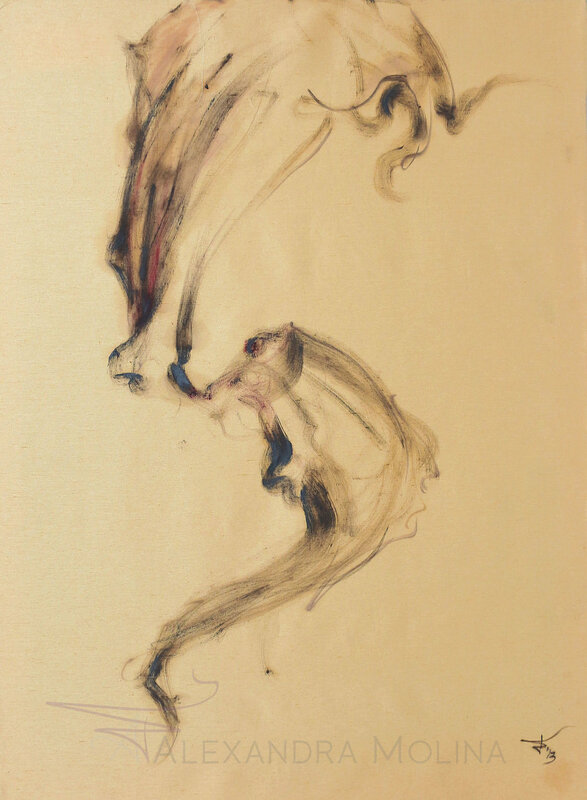 A "golden-oldie" in my eyes, this meditative painting explores push and pull concepts shaped by our dance experiences. The fabric softly shimmers in the light, setting a peaceful and mindful space for thought.